CYCLONE Debbie is doing her worst in North Queensland as the Category 4 system begins to make landfall on the mainland between Airlie Beach and Bowen. Residents in the rural town of Bowen, predcietd to be ground zero for the devastating weather event, are beginning to feel the effects of the system Queensland Premier Annastacia Palaszczuk has described as "equivalent to a one in 100 year event". 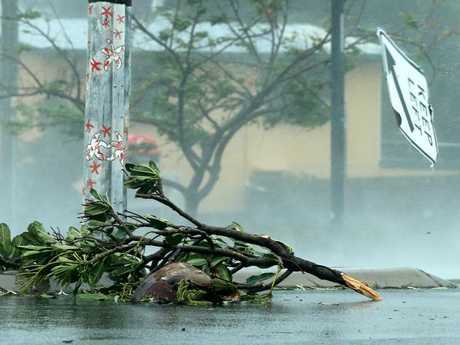 Roofs have been ripped from buildings and flying debris has begun to cause damage as cyclone's most destructive zone impacted the Whitsunday Islands and mainland towns including Airlie Beach, sending residents into a panic before making its way further inland. According to the Bureau of Meteorology's latest warning issued at 1pm Queensland time (2pm AEDT) the system is beginning to make landfall on mainland coast between Bowen and Airlie Beach with wind gusts potentially reaching 270km/h near the centre. After the coastal town was lashed by destructive winds and sheeting rain the storm has significantly calmed over Airlie Beach as the eye of the storm reaches the town before the chaos begins again. A video published by ABC journalist Jonathan Hair from an Airlie Beach apartment shows a fan blowing in the wind that had been ripped from the ceiling and large pieces of debris being dragged by harsh winds across the building's balcony during the worst of the eye wall's impact. While there is even more destruction to come, residents in the path of Cyclone Debbie could be waiting until Wednesday for emergency help as the slow-moving storm keeps the region in lockdown. Northern region SES manager Dale Camp said strong winds are expected to continue into the evening. The high-level category four system is not expected to weaken to a tropical low until midday on Wednesday. "It's a very slow-moving cyclone, so we're talking anywhere between six and 14 hours until it's completely over in each location," he said. "So that puts it well into this evening, and that's the problem, everyone is going to have to stay in their house all day, and then stay there all night as well. Mr Camp said poor light in the evening will hamper any clean-up efforts. "We have to wait for that wind to die down before we move around, and if it's at night time it makes it very difficult to see things like floodwaters, so they'll probably be waiting until first light tomorrow," he said. Speaking in Parliament in Canberra, Prime Minister Malcolm Turnbull said the federal and Queensland governments had "activated the disaster response plan". Mr Turnbull told parliament the Australian Defence Force had set up a joint task force and was ready to deploy assets to the affected areas. Brigadier Chris Field, who played a key role in the 2011 flood reconstruction in Queensland, has been appointed recovery co-ordinator. "There's 1000 people deployed or on standby to assist, and we thank them for their courage, commitment and selfless service," Mr Turnbull said. 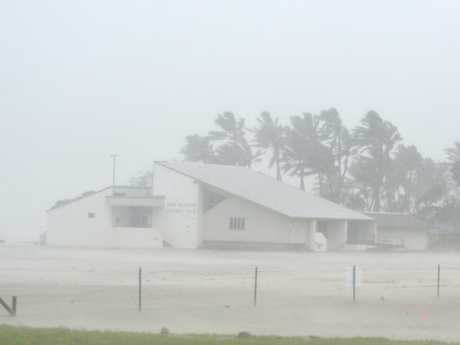 News.com.au reporter Emma Reynolds was in a hotel about a kilometre away from the beachfront but still in ankle deep in water as the eye wall hit. "The wind is really ferocious, really intense now," she said. "It's roaring like a fighter jet. "We can't see the water at all. The sky is completely misted with sheets of rain flying across and branches are being ripped from the trees. "We've heard that the wind is so strong people can barely stand up at the marina." She said hotel guests, many of them evacuated local families with children, were beginning to panic about the loss of power and communications. There are also questions about how long supplies will last. "People are starting to get a bit stir crazy... We definitely feel quite isolated." "We have a reasonable amount of bottled water and some food but not enough for days and days. We were told to fill up the bathtubs for extra drinking water, but it just keeps draining away." The mist at Airlie Beach has cleared enough for people to see the astonishing sight of a boat on the water being thrown about in "huge waves". Reynolds said: "I've got no idea whether it's emergency services or who it is but it looks terrifying - anyone on there would be very ill."
Hotel guests have been told the cyclone's eye could take up to three hours to pass over them. "And then it is supposed to get much worse." Earlier she reported that the wind was "frighteningly loud", even at 2am Queensland time. "We can hear it howling through the trees and frequent banging sounds.". "Everyone is trying to get some rest but the noise and worry makes it difficult, as well as the fact we know we may need to move down to our hotel's underground carpark at some point. "The power went out just before 10.30pm so we've been using torches and trying to conserve mobile phone battery as we don't know what's coming next. Residents on Hamilton Island have reported winds "like freight trains" as the cyclone's "very destructive core" passes through the popular holiday spot. At the island's airport wind gusts up to 263km/h were recorded before dropping to 213km/h. The Category 4 cyclone is the worst the state has seen in the past six years. David, a caller to Nine's Today who is staying on the resort island, said the scenes outside were "like world war three" as he witnessed a tree fall through the roof of a nearby villa. "I am standing, actually, on the toilet looking out the tiny little window and villa number 42 has copped it, a massive tree has gone through the side of the roof," he said. "The winds are insane. I can't imagine it getting any worse than this. All the trees are destroyed. It looks like world war three to be honest outside." 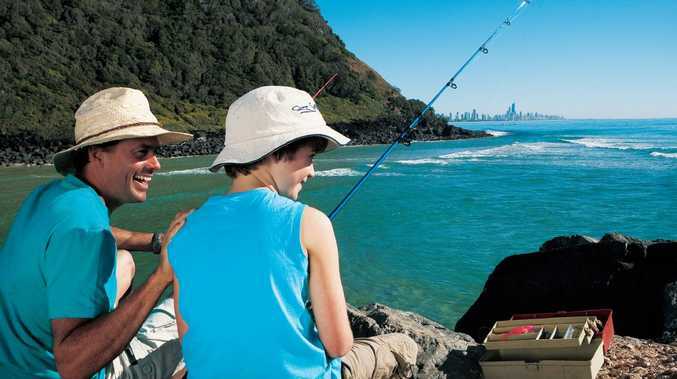 Lissa Morris has lived on Hamilton Island for 14 years and has had a house on the island for almost 30. She spoke to news.com.au from her home in the centre of the cyclone's path. "It's massive and so frightening. It's right on top of us now and it's stalled with winds in excess of 200km/h," she said. "It is so noisy, it's like half a dozen 747 jets coming through. It's incredibly loud through the windows. Whether the house will stand a Category 5 which they are predicting, I don't know." The slow-moving cyclone was previously expected to make landfall on the mainland by 2pm AEST (3pm AEDT), but came a lot quicker as the cyclone picks up speed - heading southwest at 12km/h at the time of landfall. "While small temporary variations in the track have been observed, as happens with all cyclones, the system is still forecast to move slowly west-southwest over the next 12 to 24 hours," BOM's alert read. "The cyclone is beginning to make landfall on the mainland between Bowen and Airlie Beach, and will move gradually inland through this afternoon and evening. As the system moves inland, the peak winds near the centre will begin to weaken." At nearby Proserpine, residents have reported "horrifying" destruction, saying several roofs had been ripped from homes. Local woman Sue told ABC radio her neighbour's roof had smashed into her home's side window letting rain and heavy debris into the house. "The doors are shaking and we've got venetian drapes flying out the window," she said. "I've lived her my whole life and this is the first time I've had damage like this. "I can't believe how long it's taking, it's really horrible... I think because of the damage with out house that's what's so horrifying." 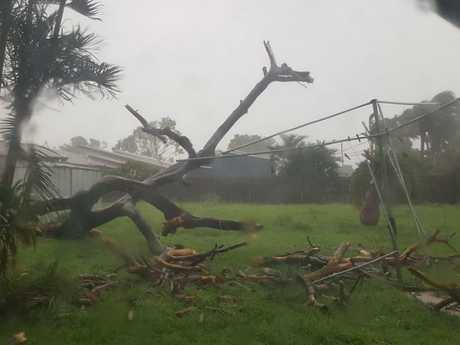 North Queensland's Whitsunday Islands were taken into in the grip of the Category 4 cyclone's power as the tropical system brought destructive winds of up to 270km/h hours earlier. "It's just like freight trains coming through left and right," a Hamilton Island resident told ABC. "The trees are going wild. The place is just shaking continuously." The slow-moving cyclone is nearing landfall, but threatens to hang around for up to 18 hours before it passes. The Bureau warned between 150mm to 500mm of rain could fall today and river flooding will likely follow. Storm surge is expected to lead to waves of up to 8 metres on the Mackay coastline, which is already being lashed as the cyclone nears landfall. Imminent destruction has transformed the usually buzzing streets and beaches of the state's tourist hot spots into ghost towns as residents and visitors hole up in their houses seeking safety. Showing images of steel awnings tearing away from shopfronts, Nine reported entire roofs had been ripped from buildings and debris was flying through the air at Airlie Beach. Whitsundays Mayor Andrew Wilcox said extreme winds were making trees look like they were dancing. "Outside it is just pouring horizontally, the rain is falling sideways, the trees look like they're in a disco and it hasn't even arrived yet," he told AAP. "It's still 100 kilometres away and the wind is getting very strong ... we've got plenty of places to hide in the house if it gets worse." Premier Annastacia Palaszczuk has warned residents and visitors the cyclone will be "absolutely destructive". "It's going to be a really tough time, a really harrowing time for thousands of families in the path of Cyclone Debbie," she said. ​Cyclone Debbie was officially upgraded to a Category 4 at 8pm Monday night as Airlie Beach lost power and Hamilton Island copped 178km/h wind gusts. A striking warning from the Queensland Fire and Emergency Services followed. QFES issued an alert last night to "bunker down", as teams would have limited capacity to respond until the cyclone passed. It said people should prepare now by turning off their electricity, gas and water as well as unplugging all appliances. "Shelter in the strongest room of your house," and "keep your emergency kit close by", emergency services warned.